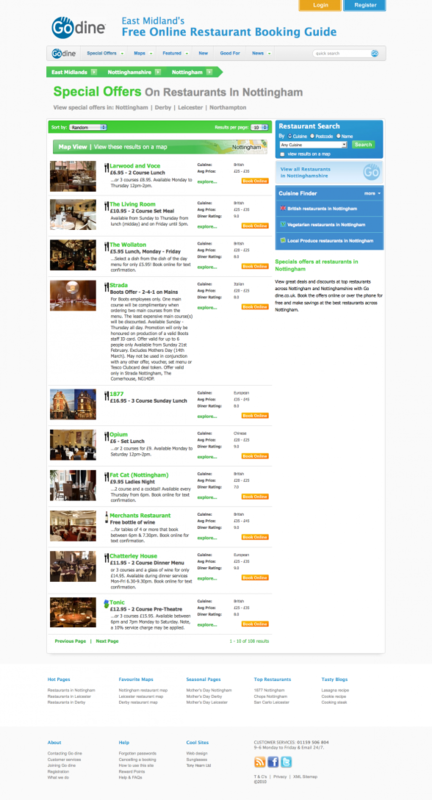 Godine is a restaurant booking service in Nottingham. We have been working with Godine designing, developing and optimising the site continually for the last year and a half. The site has had a wealth of technology and new features added since its original conception. As such it has outgrown its current design. Last night in a brainstoming session we fleshed out a gameplan for a new website design…. It is only the seed of an idea for a coherent theme and will be further refined with user feedback and testing. Here is the same page in the existing site. The goal is to improve conversion for the site by simplifying the components and the user experience with better signposting and call to action.